Or maybe I should say Exits b through f. Today we're traveling through Brooklyn and Manhattan to listen to five different systems, their unifying factor being DeVore. I want to say upfront that this leg is taking a bit of a critical diversion. As we developed the idea for this tour, Srajan thought it would be interesting to get into a bit of a model comparison. After all, this was a rare opportunity to hear a number of speakers by the same designer in the course of one day - the Super 8s ($4,000), The Nines ($6,500) and the Silverback Reference ($15,000). This type of comparison necessarily gets me into a more critical mode than the relaxed Road Tour norm. It also raises one potential issue which is - I know John DeVore and I'd say we've developed a friendship. So for those readers who believe you can't do both -- be friends with someone and offer an unbiased opinion about their product -- you have been duly warned. Feel free to stop reading now before you are unable to control yourself as you're carried away by my prose to your nearest DeVore Fidelity dealer, checkbook in hand drooling. One very interesting aspect of my day was the chance to hear the same speaker, the Silverback Reference, in four different systems and four very different spaces all in the span of a day. While this offered a rare glimpse into the effects of room and gear, I should also stress at the risk of sounding like a broken MP3 that the following observations are necessarily limited. After all, they'd have to be as the systems and rooms were unfamiliar. And we are talking about just a few hours with each. For you movie buffs, the name Charles Stone III should ring a bell. Among others, Charles directed the critically acclaimed Drumline. He was also the man behind (and in) the Budweiser 'wassup' commercials which snagged him a Grand Prix Award at Cannes (the first black director to receive one). Stone has also directed a number of music videos for bands such as Living Colour, Public Enemy and The Roots, and in the process won numerous music industry awards from CEBA, Billboard, The Source and MTV. 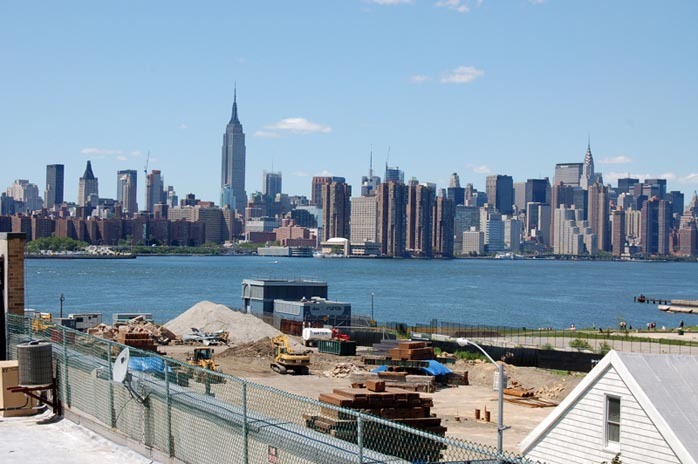 Our first stop finds us just about a mile from the Brooklyn Navy Yard and the DeVore Factory. 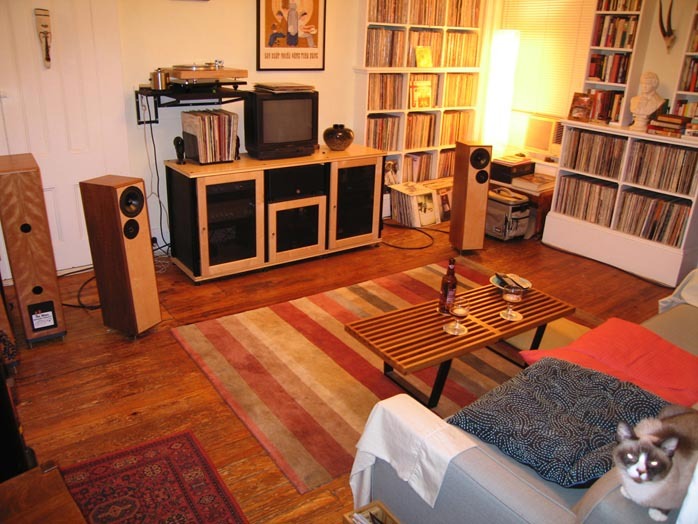 The system consists of the DeVore Silverback Reference speakers, the original Pass Aleph 3, the Krell KAV 300r receiver acting as tuner/pre and the Sony Playstation as CD spinner. The home theater section includes the Runco PL43 plasma TV and controller and the Denon DVD 2800. The Pass porcupine is audio's classic cube. This originally black chunk'o'heatsink puts out a whopping single-ended class A 30 watts per channel. Time, heat and metallurgy have burnished the black to a lovely warm reddish hue. The listening space to be filled has 18' ceilings and is roughly 15 x 20 although this room opens onto 2 hallways and an open kitchen. As you can see from the pics, the Silverbacks stand at either side of the Runco making for some delectable home theater 2.0. As we let our eyes travel, it's impossible to miss the wonderful art that graces every wall. There are also a few vinyl figures scattered about including some by the master of vinyl, Michael Lau. 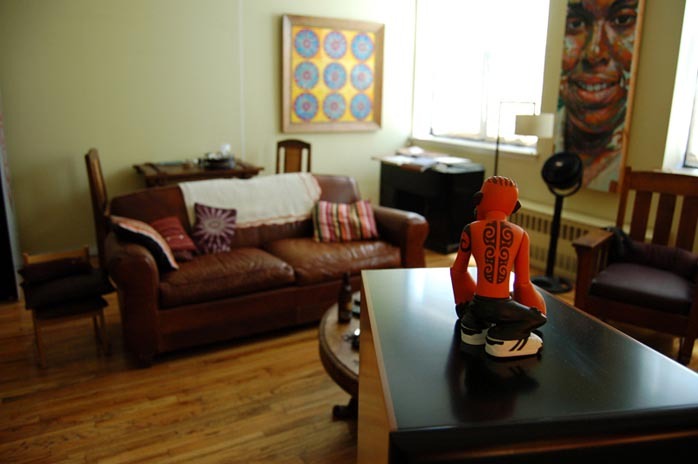 Comfortable, relaxed and completely non-fussy describes the full experience at Mr. Stone's place. The Robotron arcade game stands across from the system, a sentinel to 1980s fun. 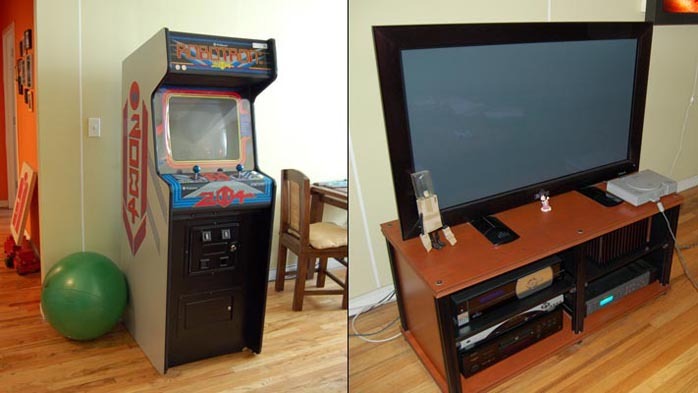 Funny too that the Playstation from the same decade has elicited so much forum attention. And oddly enough most of the fun has been stripped away in this context. It kinda makes me wonder why anything attached to hifi necessarily has to go through that sphincter, squeezing the basic fact -- this thing sounds good -- into any of a million much smaller and much less important points. Wassup with that? The Silverbacks strapped to the Aleph 3 filled this larger cube with music. It did not over or under-power the room. It was balanced. We listened to a bunch of CDs including some funky John Zorn, ratty and raucous Live Seeds but the highlight for me was watching the big battle scene from Drumline on-screen and hearing the raps, taps, thwacks and thumps fill the room to stadium-sized entertainment. Scale, presence and most importantly flow combined to make for an engaging experience. The Silverback's frequency response is rated at 21Hz to 40kHz and they are a relatively easy load at 8 ohms; always above 7 and below 15. 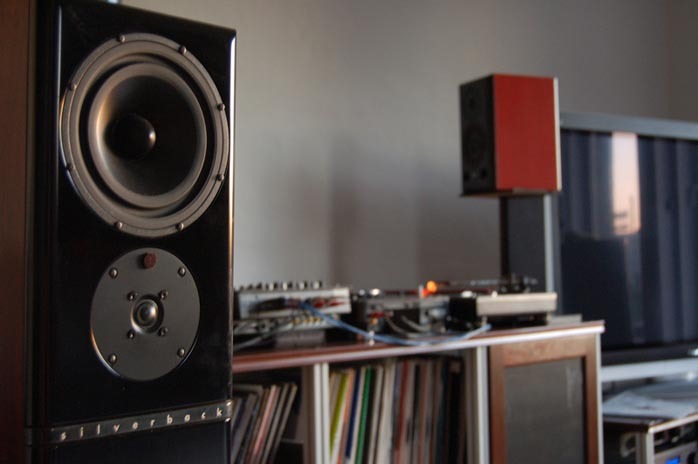 The Aleph showed no signs of strain and controlled those dual long-throw 8' woofers without any problem. 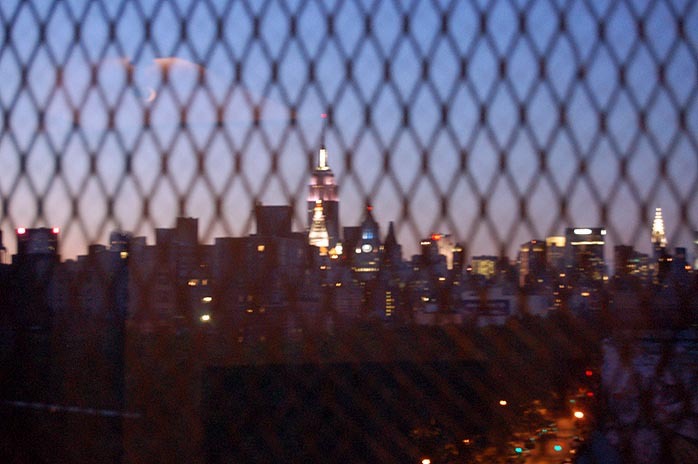 Josh Roseman's home, studio, performance and recording space is also in Brooklyn. To summarize, Josh is a trombone player, recording engineer, co-founder of Groove Collective and Giant Step, an original member of the SFJAZZ Collective as well as leader of his own band - the Josh Roseman Unit. Coming in from the light and noise of the Williamsburg streets to this quiet, colorful and beautiful dimly lit space nearly derailed my purpose. I wanted to melt into one of many comfortable cowhide-covered seats and soak in some live music. Actually, there was such a wonderful vibe in that space, I could have forgone the music and just sat and soaked silence. 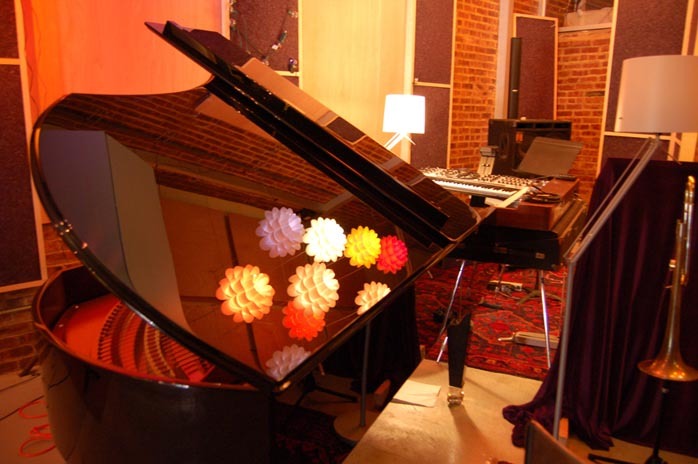 As my pupils grew accustomed to this new environment, my first thought was - a Bösendorfer Imperial? No I didn't touch one key. Not even one of the two extra black ones on the extended keyboard. Josh explained one aspect of this two-keyed extension necessitates a larger soundboard and provides a fuller sound. The first floor of this three-and-half-floored building is in the process of conversion into a performance and recording space. On the floor is the aforementioned Bösendorfer, drum kit, various mics, amps, one of many trombones and lots of acoustic treatment. In the booth tucked into the back of the building, a pair of DeVore Fidelity Gibbon 7.1s serves as studio monitors and sits atop a pile of recording gear. One flight up is a full-blown digital video-editing setup so Josh can record, edit and mix live performance DVDs. While all of this work is in-progress amongst a host of other equally large projects, there's an enviable and palpable calm surrounding both the place and Josh. From the 2nd floor we took the elevator up one flight to the living space proper where we were greeted with a breath of fresh air coupled with a breathtaking view of Manhattan and the East River from the outdoor patio. 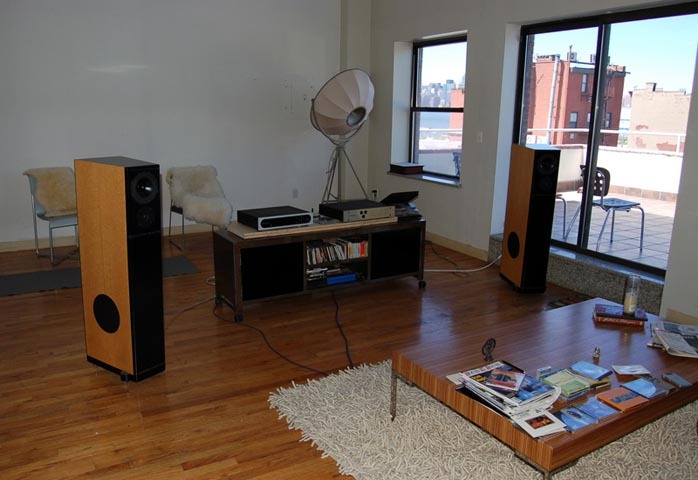 Pupils wide once again and imagination opened wider as we stepped into Josh's sun-filled living space, a pair of Silverback Reference flank a Pass Labs X150, Conrad Johnson Premier 18LS and a Bel Canto Player PL-1A. There's also a Runco projector that can throw a movie image on the big white wall behind the gear. We listened to a bunch of CDs and SACDs including some very interesting and what I'd call controversial recordings. Sitting atop that latter list is the Zenph Glenn Gould 're-performance' of Bach's Goldberg Variations from 1955. In brief, Zenph has developed a software-based 'solution' to digitizing Glenn Gould's fingers. Once virtually captured, Gould's ghostly digits play a Yamaha player piano 'live' and Zeph has recorded the event. While I admire the seriousness, skill and obvious passion that Zenph employed in this endeavor, I wonder if it's anything more than a technical curiosity. But that's beside our point today so all I'll say is we also listened to the regular old once-living Gould recordings from 1980 (when he was alive) and I enjoyed hearing all of Glenn Gould play. In another interesting twist to this already thought-interrupting experience, the Silverbacks threw out a controlled and well-defined soundspace that existed comfortably within this large and airy place. It didn't go way way back as their mid-room positioning might suggest, nor did it jump way out to the front or either side. And it didn't try to climb up to the fourth floor. Instead, the music existed as if performed by musicians in a fixed and well-proportioned, clearly defined space. Compared to our last stop, I'd also say there was more of a distinct point made to sonic edges. Attacks and decays more sharply focused without any brightness or glare. The flow of the music seemed more noticeably intent on rhythm and timing. We also listened to some of Josh's recordings and it was very interesting to see his reaction to his own playing and the more technical aspects of the recording process. Josh mentioned he appreciates the Silverback's ability to function as both a tool for technical listening during production and as pure pleasure performer when he's just listening to some tunes. Josh will bring recordings he's working on up the elevator to give them a critical listen on the Silverback system. It's become part of his process. Part of the voicing of a recording. Josh also shared a story from when he was working with another recording engineer on one of his band's CDs. 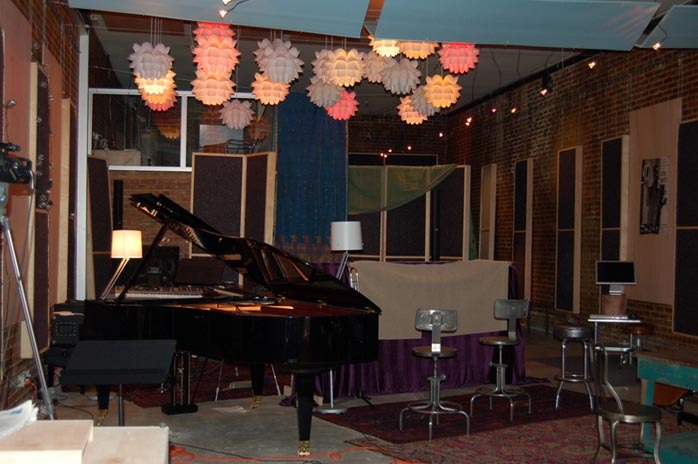 After listening to a track a dozen or more times, Josh referred to one section that he felt needed more work - "right after the trombone solo" and was surprised the engineer had no idea what he was talking about. 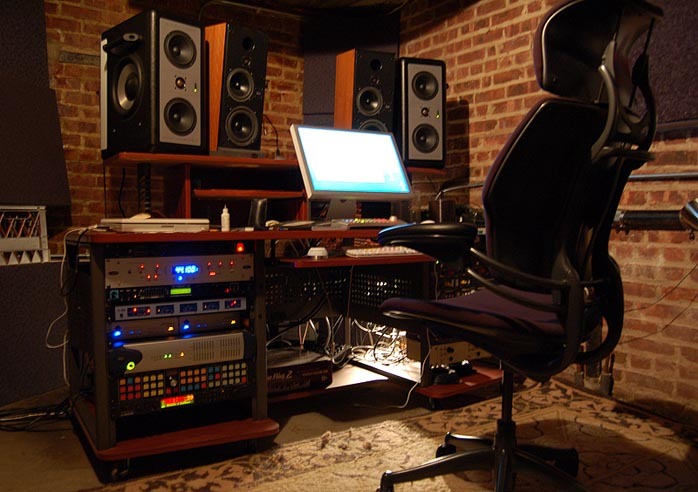 The engineer's response - "When I'm mastering I don't hear music". This concept of dual-purpose listening is interesting: the recording engineer while recording and the musician listening in to their individual performance and as part of an ensemble. If we extend this theme to the gear, we find the designer listening differently while designing. We also hear tale of the reviewers and their critical listening. And what about the audiophile? Do we listen differently when demoing gear, pre and post purchase? All different types of listeners listening for different reasons yet all in the service of one simple end; the enjoyment of recorded music. After a delightful Thai lunch and a very quick stop at Academy Music's Brooklyn outlet (I picked up a Jamaican pressing of Bob Marley's Rastaman Vibration, Sun Ra's Astro Black and Heiner Stadler and Walter Steffen's Ecstasy), we made our way over the Williamsburg Bridge to In Living Stereo. 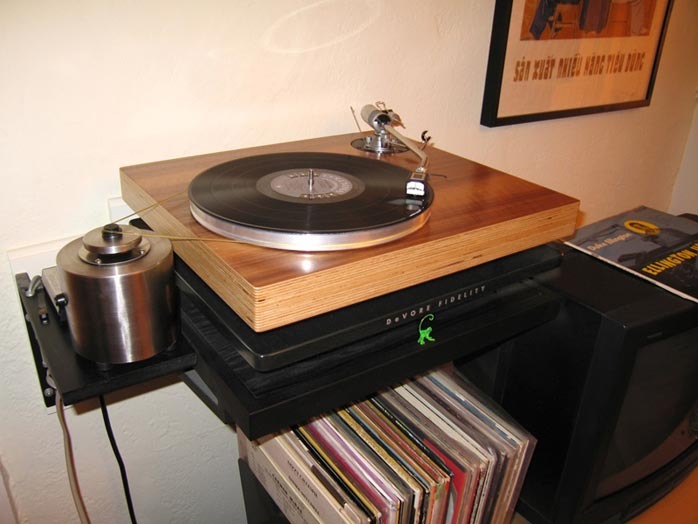 Once parked and settled, we spent some time with the Silverbacks, Shindo Montrachet (the EL-34 PP 40 watter), Shindo Masseto preamp and the Rega P5 with an EMT TSD15LZ cartridge. Also joining in on the listening fun was Jonathan Halpern the US Shindo Importer, Alex Halberstadt -- journalist, friend, former Listener reviewer, and author of a biography of songwriter Doc Pomus -- and Steve Mishoe, ILS' owner. We spun through a lot of vinyl including my new Sun Ra, Heiner Stadler's Brains on Fire Vol. 2 that contains the wonderful Reggie Workman/Dee Dee Bridegwater full-side duet, Pharaoh Sanders' Thembi, Jimmy Cliff's Music Maker (one of John's Academy finds), Benjamin Britten, Johnny Cash, Nouvelle Vague and some others. Even in this smaller space the Silverbacks sounded open and controlled. While I get the feeling we could have overloaded the room with more volume, at normal listening levels the music flowed freely, forcefully and full. In terms of comparisons to our previous stops, certain qualities shifted and aspects of the music moved either to the foreground or background. A different flavor for sure but not necessarily better or worse and I certainly haven't found one to be more faithful or more correct than another. This was also the first room with a typical room height and the 47.5" H x 17" D x 11" W 100lb. Silverbacks do not visually overwhelm. They are a rather modest big speaker. One setup detail that may not be apparent in the pictures is depending on the distance to the listening position, the Silverbacks have more or less forward-leaning rake. 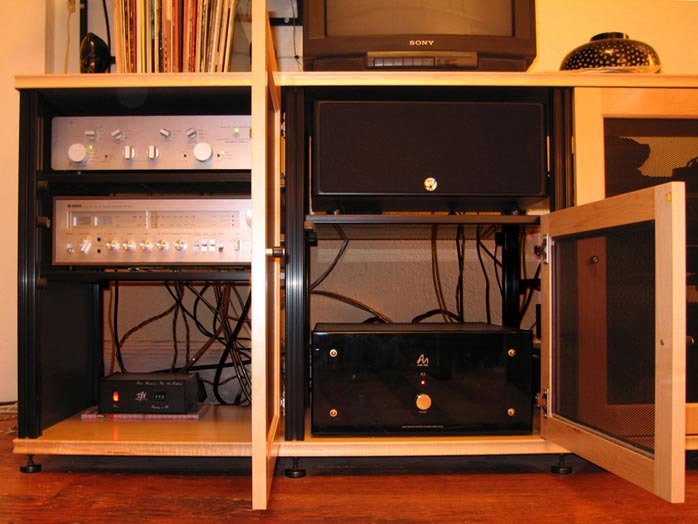 "The proper listening axis is about halfway between the midrange phase-plug and the top of the cabinet." If you were to ask me to describe the Silverbacks without referencing the room and associated gear I've heard so far, I'd say they are well-balanced, fulsome, weighty and just plain fun to listen to. 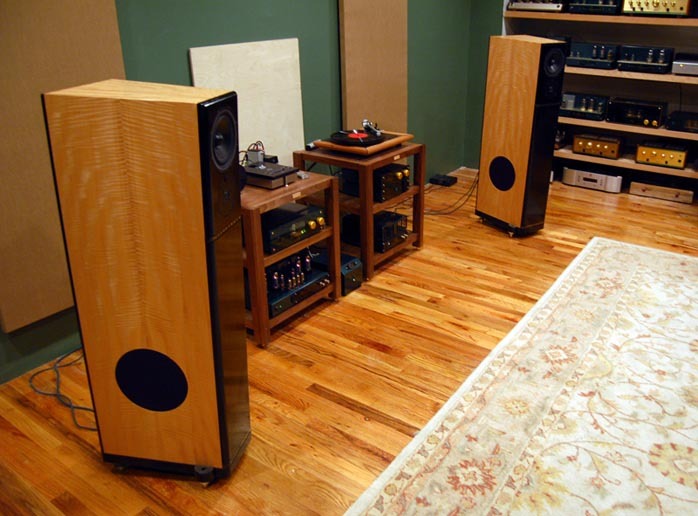 If you want to know about bass performance, tonality, treble extension and persuasion (hard or soft), soundstage or any other audiophile trait, we'd have to talk room and associated gear. That's not to say the Silverbacks are complete chameleons without a voice of their own. Just how that voice sings your music will depend greatly on where you put them and what you couple them with. If we add into this mix the fact that we all have very different tastes in music and how we want to hear that music presented, it's no wonder forums and reviews are overflowing with contradicting opinions about components. Having an opinion about a piece of audio gear is becoming a cliché. Down a few blocks and up a few stairs (7 flights to be exact) brought us to the lovely home of the very fit Hieu Pham and Irina Petrova. John timed our arrival to coincide with the sunset and I'm thankful we were a few minutes early since it took me that long to stop gasping for breath and regain composure along with the ability to focus. Facing due west (just in case you were wondering) this seventh floor loft has another amazing NYC view. 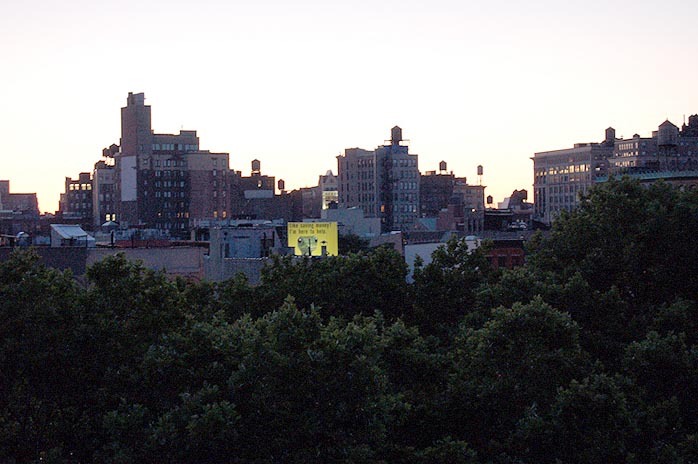 This time the amazing part, beyond the stunning sunset and Manhattan-only water tank count, are the trees that take up the lower half of the window. 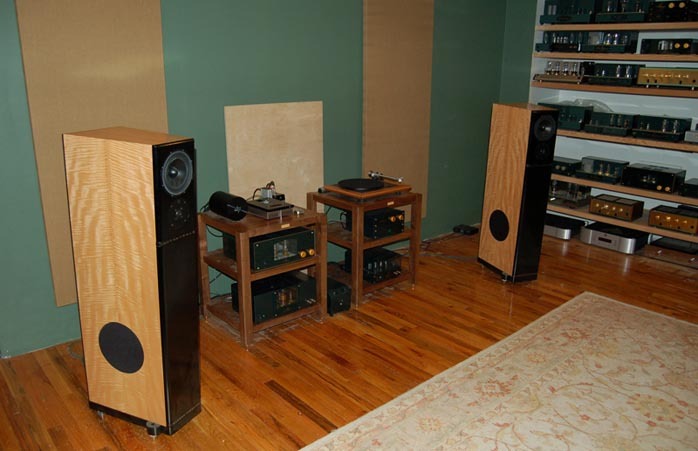 Here the Silverbacks get some room to breathe and are driven by a classic Audio Research VT130SE from 1996 which uses four pairs of 6550s for 110W into 16 ohms. 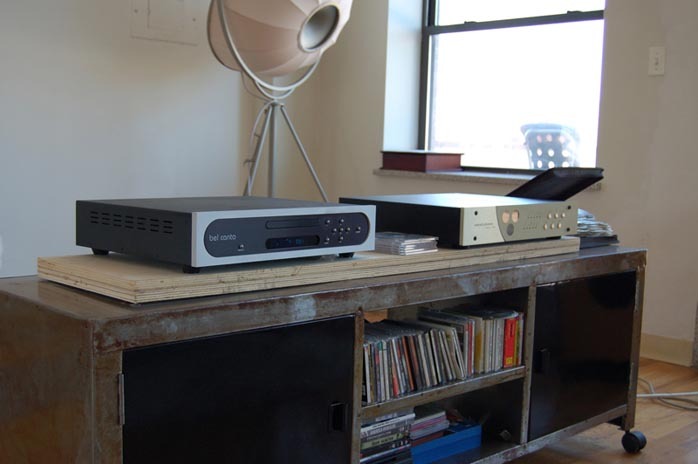 The tubed line stage is the Candela from Odyssey Audio with an original Mod Squad Deluxe Phono Drive sitting on top. 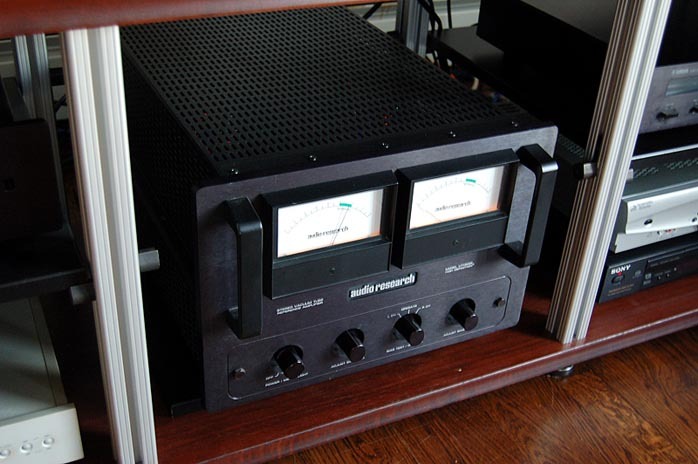 Connecting the amp to the Odyssey preamp is a custom-built amorphous-core transformer-coupled single-ended-to-balanced cable by none other than John DeVore. The turntable in use today is the Technics SL-1210M3D with a Crown Jewel cartridge. 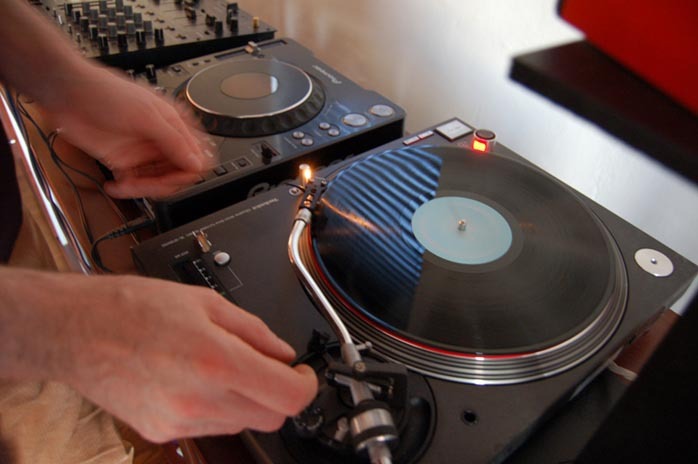 There's actually a twin to this turntable as well as a pair of Pioneer CDJ-1000MK3 CD/MP3 players, a Pioneer DJM-500 Pro DJ Mixer and a pair of Gibbon 3 used as near-field monitors. Turns out Hieu is a DJ into the wee hours after he's done lawyering. Based on the room pics, setup and amp, would you be surprised if I said the Silverbacks sounded huge and powerful? That "Since I've Been Loving You" from Led Zeppelin II was just wicked? And side one of Dark Side of the Moon so palpable it almost made me remember the first time I heard this album when it came out? Some stuff is obviously obvious, isn't it? 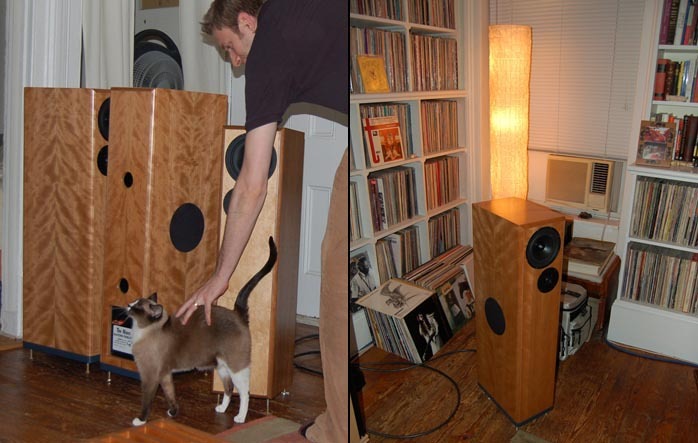 One lovely thing about mating a speaker to a room and amp is when the coupling truly energizes the room. 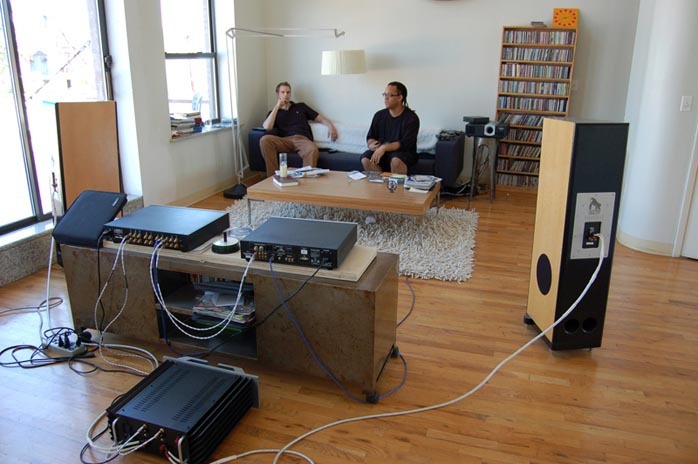 I don't mean overwhelming or overpowering as you'll hear in nearly every room at nearly every audio show. I mean a perfect power-to-volume (both kinds) ratio. One indication that you have things copasetic in these terms is when you crank up the volume to 11, the only thing that changes is volume. Scale remains the same. The sonic mix, meaning the amount of various frequency parts also remains the same - bass doesn't suddenly jump out and cymbals don't make you screech. It just gets louder. More visceral, more consuming, more fun. In some ways, if you had come along for just the first stop on today's tour, you could easily think the Silverbacks are super smooth with very controlled bass extension. Maybe a bit polite compared to some other more surgical speakers but still detailed and resolute. Great for jazz and small scale classical. But if you just hit stop 2, you might say they were punchy and detailed with great bass and separation. Good for large-scale classical. Maybe not as timbrally rich as some other speakers but still very musical and involving. Stop 3ers may conclude their Silverbacks were tone monsters with equally monstrous bass and groove. Powerful and punchy, great for blues, soul and R&B. Those that made it up the 7 flights to stop 4 would be grabbing for classic rock, metal, rap, electronica, industrial and anything that tends to get played loudly. And anyone who's been with us all day would conclude the Silverbacks can be any of these things. Our last stop of the day brought us home to John DeVore's home. Sitting comfortably amid the hustle and bustle of the lower east side which has taken on the adage "the city never sleeps" proudly, I was thankful for the first-floor walkup. When we arrived, John had a pair of Gibbon Super 8s hooked up and Mai, John's wife had a sextet of cupcakes plated and waiting. Your choice? 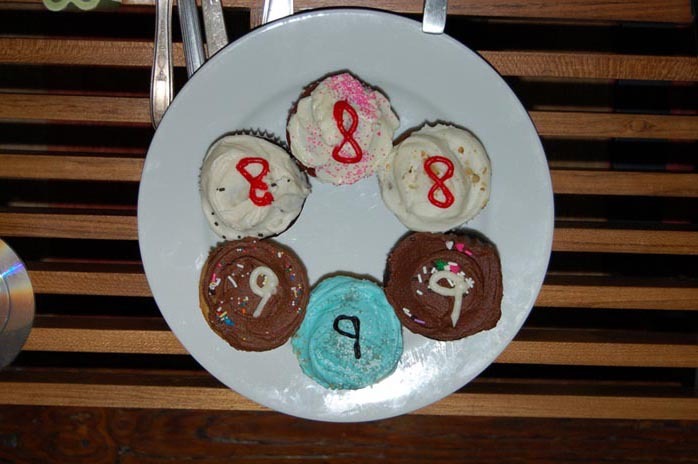 Eights or Nines. Silverbacks would never fit on a cupcake. This setup would change to The Nines after some time but the rest of the system stayed put; the Audio Note P3 Silver Signature handled amplification, a classic Counterpoint SA-5000A full-function preamp took the signal from a one-of-kind (so far) DeVore Fidelity turntable/plinth and an EMT XSD 15 stereo cartridge and EMT XOD 25 mono cartridge both riding on an original SME 3012 tone arm. Oh, and that plate would change as well; the Eights and Nines giving way to plate. The Super 8s are 6 for 6 in terms of reviewers reviewing and buying. There are also the reviewers who own having never reviewed - like our own Ken Micallef and yours truly. While the phrase "reviewers bought them" makes me bristle on some level, specifically the one that seems to imply this somehow means more than non reviewer ownership, I have to say there is something to this distinction. Gasp. And that something is that a reviewer typically gets to spend a few months (3 in 6moons' case) with review gear, in their home, with their gear. We get to live with something and try it out on our stuff for a few months. When I compare this experience to the typical equipment demo, I'm simply pointing out the obviously obvious - the review period and process gives the reviewer a better idea of what a given component can do versus an audition. It also introduces our room to the component in question and if that component is a speaker, all the better. We spun a lot of vinyl till the wee hours. We also hit some repeats from the day and I was pleased to find John and Jonathan -- who was able to join us on this last leg of the tour -- were as enamored of Devendra Banhart's Cripple Crow as I am. Well not quite - but they liked it. As a Super 8 owner, I would think it's obvious I like this speaker. What I like about the Super 8s is they are well-balanced on all of the sonic points that matter to me. 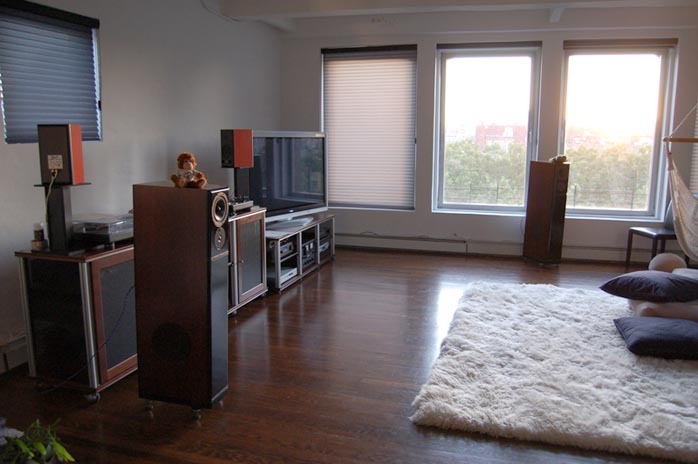 For a modest to mid-sized room they can take over your senses and fill them with nothing but music. And I have to admit, they sound as good as I've ever heard them at John DeVore's. Go figure. Jenny Lewis and the Watson Twins Rabbit Fur Coat, Bjork's Music From Matthew Barney's Drawing Restraint 9, Jukka Linkola, George Benson/Ron Carter,/Jack Dejohnette, Juana Molina and more. The music was clearly in the foreground, audiophilia and critical listening retired. After a few hours, we switched to the The Nines. For those who missed Srajan's preview, the Nines add a side-firing 6.5" driver to the Super 8s (contributing their output below 100Hz) and a few inches in every dimension (38" H x 14.5" D x 8.5 W). I've heard a few prototypes of the Nines in my home, had a very brief listen to a finished pair but this was my first full-fledged Nines session. Sometimes more is too much. One cupcake is good, two cupcakes uncomfortable while three can overwhelm and render your senses nearly mute. But in the case of the Nines, more is good. I have to admit I was expecting a dramatic difference when John put the Nines where the Super 8s had been. But the difference wasn't dramatic and it wasn't subtle. It was more. Good more. The musical presence gained body, weight and force. While a few extra dB may suggest a bigger bottom, that does not tell the whole story. That extra 4dB of bottom end on paper translates into more boogie power in-room. More gusto, more gut-wrenchability. John also commented that The Nines are better able to cope with a less than optimal room making the difference between the Super 8s and Nines more extreme. But the sonic signature of DeVore was still clearly present as it was on the Super 8s and Silverbacks. At this stage of the day, I'd call that stamp lyrical, listenable and ultimately musical. Even after 14 hours give or take. After some stereo time on the Nines, we put in the EMT XOD 25 and spun some mono. J.J. Johnson, Henri Mancini's Hatari, Chico Hamilton Quintet Featuring Buddy Collette, Thelonious Monk's Criss-Cross, Duke Ellington & John Coltrane and they all sounded wonderful. 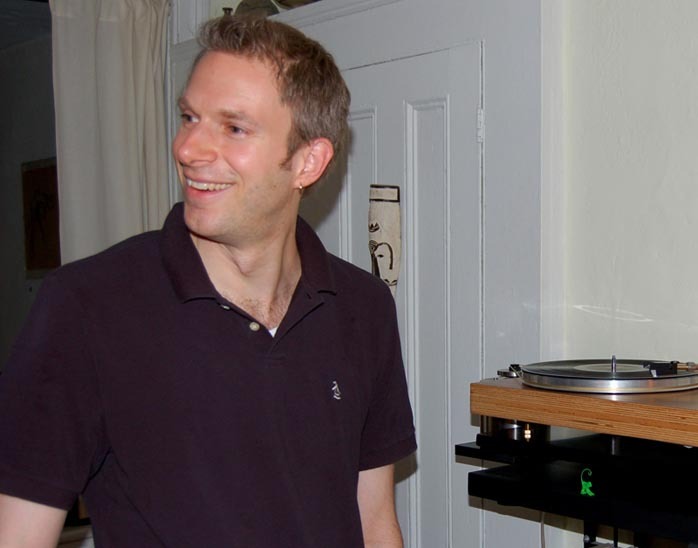 Jonathan pointed out that mono recordings have more dynamics and jump compared to their stereo brethren and I agree. And with the stereo effect stripped away, it's even easier to focus on the performance, less on the sounds. For my tastes, that's always a step in the right direction. And here's an area where I find all the DeVores to excel - a focus on the music. I hear a sonic semblance of order and similarity between the Super 8s, The Nines and Silverbacks that speaks to a vision and voice of the designer. While I think this will hold for most, I have heard multiple speakers from the same designer that sounded like they were engineered by Jekyll for one model and Hyde another. There's a sensibility in John DeVore's approach to music making that is coherent and embodied in each of his designs. Within this lineup, more money buys you more speaker. 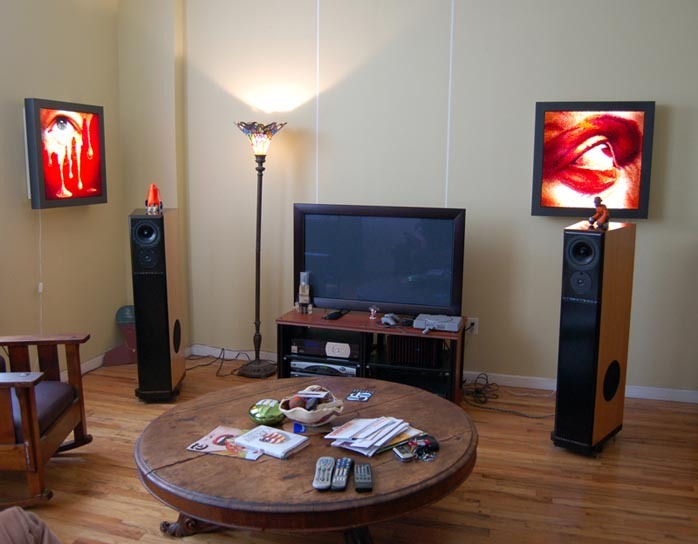 More speaker buys you the ability to energize a larger room. The ability to energize your room makes for a musically engaging and convincing presentation. Gibbon Super 8s, The Nines, and the Silverback Reference. Small, medium and large? On some level, I'd say yes - it is that simple. 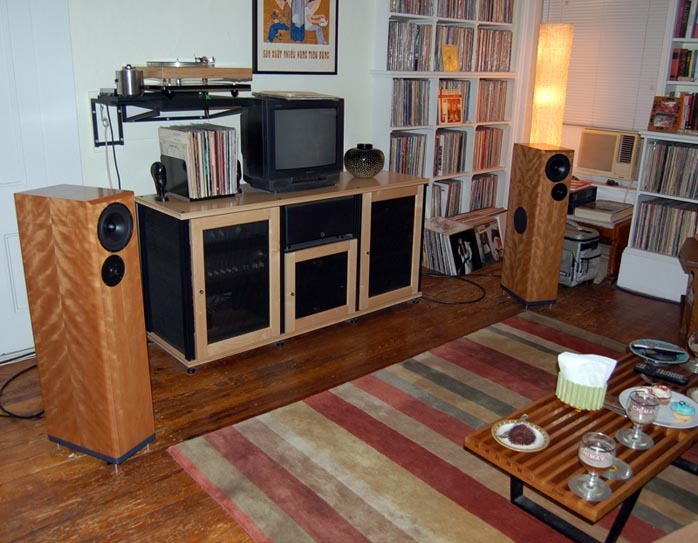 Each DeVore Fidelity model has a similar sonic stamp that does not live in audiophile minutiae. Luckily neither does music. And I'd generalize this common character as the ability to present music's lyricism, its flow, emotion and songfulness. While we could shift other aspects of the presentation with room and gear, this essence stayed fixed throughout the day. Perhaps the most important thing I can say about my day with the different DeVores was the realization that nothing got in the way of the music.